Hot summer nights inspire a desire for ice-cold libations served in romantic surroundings – and several of New York City's top hotels are offering cocktail programs that couples can sip and savor. From aged and distilled spirits to distinctive microbrews to honey-inspired creations, these four very distinct venues are serving up an intoxicating taste of summer. Artful Sips at The Palace: Inspired by the summer-long installation of Dorit Levinstein’s vibrant “Studying the Masters” sculpture in its courtyard, the Palace Gate outdoor lounge at The New York Palace has created “Renoir’s Dancers,” a cool libation of Bulldog Gin, St. Germain, lemon juice, white cranberry and spoonfuls of red, blue and green basil seeds (shown above at left, $20), which is designed to capture the color and energy of Levinstein’s work. If the weather is not cooperating, you can also be dazzled by the 14-karat decadence of the hotel’s Gilt Bar (formerly the Villard Mansion Music Room featuring ornate circa-1884 walls and doors). 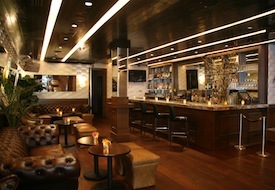 Tuesdays at Two E: If you’re a fan of jazz and aged distilled spirits, schedule a Tuesday night at the cozy and atmospheric Two E Bar/Lounge at The Pierre, New York. 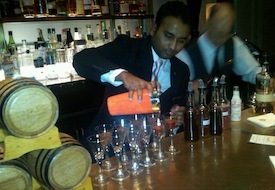 Its Barrel Aged Cocktail Festival runs through the end of July and features a trio of potent and flavorful specialty cocktails created by the bar team (from spirits aged in oak barrels for six weeks, shown at left with bartender Sachin Hasan) and accompanied by a jazz trio. Available in $14 full-size glasses or an $18 miniature flight trio, the cocktails include “Aged Beauty” (Ron Zacapa rum infused with vanilla and mixed with homemade rhubarb syrup); “Epitome of Elegance” (date-and-fig-infused Leblon Cachaca finished with Maraschino Liqueur and Campari Bitters); and “Timeless Grace” (Old Overholt Rye Whiskey infused with dried cherries, mixed with Lillet Blanc and Glayva Liqueur and finished with orange zest). Chef Ashfer Biju (newly transplanted from one Taj Hotels’ Palace hotels in India) also created delicious light snacks to accompany the drink menu. Dreaming of a Microbrew: Beer-loving couples should check out the recently opened The Bar at Dream New York in midtown, where seated on clubby brown-leather sofas amid antique mirrors (shown at right) you can choose your favorite brew from the extensive “Beer Manual,” which also includes a detailed review, glassware suggestion and Beer Advocate Bro Score. A total of 31 selections from around the country and the globe are priced from $9 and up per glass and include craft beers such as Troubadour Blond Ale and Innis & Gunn Rum Cask as well as more familiar labels. Non beer-lovers can order from a menu of refreshing cocktails, such as a French Margarita and a Basil Martini. Yes, Honey: The first harvest is still a few weeks away, but once the bees in the newly-installed hives atop the LEED-certified InterContinental New York Times Square have done their thing by July, the hotel’s Todd English-helmed Ca Va Brasserie & Lounge will debut honey-infused cocktails, such as the Haute Honey Flip (Grey Goose Vodka, honey, Aperol, lemon juice and egg white). Sweet! See our New York City destination guide for more trip-planning information, then use our Travel Search price comparison tool to find the lowest rate on flights, hotels, cruises, and more travel deals.